Cooking with a conscience? It’s not just kale and tofu! Meet a champion of the environment and the local food movement around Maryland’s Chesapeake Bay. 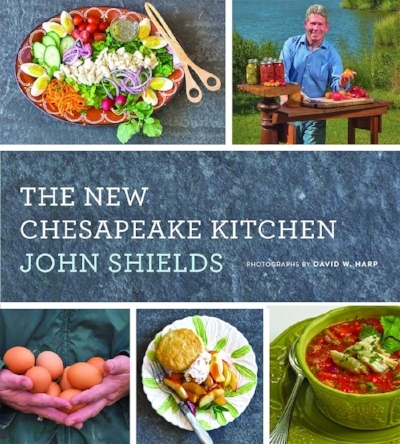 John Shields, owner of Gertrude’s Restaurant at the Baltimore Museum of Art, will talk about his new book, The New Chesapeake Kitchen, and his passion for healthy food flavors and local ingredients. Captain John Smith, upon entering the Chesapeake, wrote in his diaries that the fish were so plentiful “we attempted to catch them with a frying pan.” That method sums up classic Chesapeake cooking?fresh and simple. In The New Chesapeake Kitchen, celebrated Maryland chef John Shields takes the best of what grows, swims, or grazes in the Bay’s watershed and prepares it simply, letting the pure flavors shine through. Honoring the farmers, watermen, butchers, cheese makers, and foragers who make the food movement around the Chesapeake Bay watershed possible, along with the environmental and food organizations working to restore the Bay, the land, and food security, Shields promotes a healthy locavore diet and a holistic view of community foodways. Copies of The New Chesapeake Kitchen will be available for purchase.